We have the perfect prize wheel for every event! Thanks for visiting Prize Wheel Advantage! Our company manufactures and designs promotional games for trade show booths and carnival events. Every year we ship thousands of products across the United States and Canada. These carnival games are used everywhere, starting with small fundraising events all the way to large events for fortune 500 companies. What is a Prize Wheel? 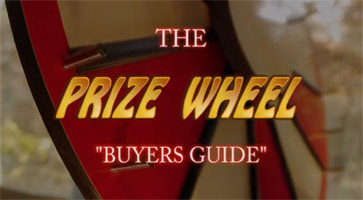 spinning prize wheels are used in a wide variety of events and marketing campaigns to increase consumer participation and entice new clientele. Many of our customers offer discounted products or services on a prize wheel as an incentive to purchase or register their information. Feedback from our clients indicate that they experience an increase in sales and participation by incorporating this concept of having a chance to spin for a prize. Over the last few years our customers are comprised of professionals from many backgrounds which include; retailers, insurance agencies, not for profits, restaurants, sports and educational institutions. Every industry can benefit from the extra attention created from a small investment in this promotional game. Our original Dry Erase Prize Wheel was designed to exceed the quality and durability of all our competitors. With steel hardware and a dual bearing system, these games are constructed to last for years and create an easy method of customization for everyone's needs. We then introduced our Insert Your Own Graphics wheel that makes it easy for anyone to customize and create a professional look. Simply use the templates from our website. Just download the template, edit on your computer, and then print out the finished artwork. Trim on the cut line and slide your custom inserts into the rail system for a custom look. Our fully Custom Prize Wheels are unmatched in the quality and flexibility of adding any amount of graphics and text to the surface. With our state of the art printing this option makes a fantastic impression on your potential clients. We offer graphic design services or you can submit your completed artwork for us to use. Now we even offer same day shipping on some of our most popular products! With expedited shipping you can have a product to you within one business day. Should I rent a prize wheel? Many people contact us regarding rental options. We do not offer product rental and here are a few reasons why: Shipping expenses are not practical. Customization of products would not be available. The fact that our prices are not that expensive which makes them affordable for any organization or company to buy. Also, in shipment and returning of products it is not uncommon for products to get lost or damaged. These few reasons alone make it impractical to offer a rental option. A prize wheel is intended to be handled, and spun by thousands of people. To think that you can buy a similar item on a discount website and have it perform as it should from one event to the next is ridiculous. Don't take a chance on a low quality brand. Here are some things to look for when purchasing; quality bearings, solid frame, durable hardware, craftsmanship warranty. Beware, some products on the market today are made from plastic or foam. How does our prize wheel compare to these cheaper alternatives? Every one of our items do use dual stainless steel bearings. All of our frames are made of solid hardwood oak. The hardware on all of these units are made of solid steel (pegs/bolts). We have a full one year warranty that covers manufacturer defects or craftsmanship problems on every promotional game we produce. Let's look at our sizes. Our selection starts with our small mini prize wheel. This is a 16" diameter wheel and comes in all three varieties; dry erase, custom, or insert like all of our other size selections. Next is our 24" diameter spinning wheel which is our most popular choice. Both of these have the option of a very nice travel case that makes these products easy to transport and also provides extra protection for your investment. Our medium size wheels start with the 32" diameter game wheel. We offer a wooden hard case for shipping and storage purposes on this size. Lastly is our most impressive sizes, our Big Prize Wheels come in 40" diameter and 48" diameter. These units have a solid floor standing frame that makes them a fantastic addition to any showroom or large venue. We do offer fully custom designs and can produce almost anything you ask for. Feel free to contact us or email us with your concepts and we will let you know the estimated cost and production time. We have done custom displays, backers, sizes and designs for past customers and welcome the opportunity to create new ideas.